The trad band playing on the bar, before us. It often occurs to me that I live a rather strange life. Not the visited-by-aliens-who-tell-me-to-wear-lederhosen-and-throw-cheddar-at-people kind of strange...just...odd. Sometimes absurd. Take last weekend. 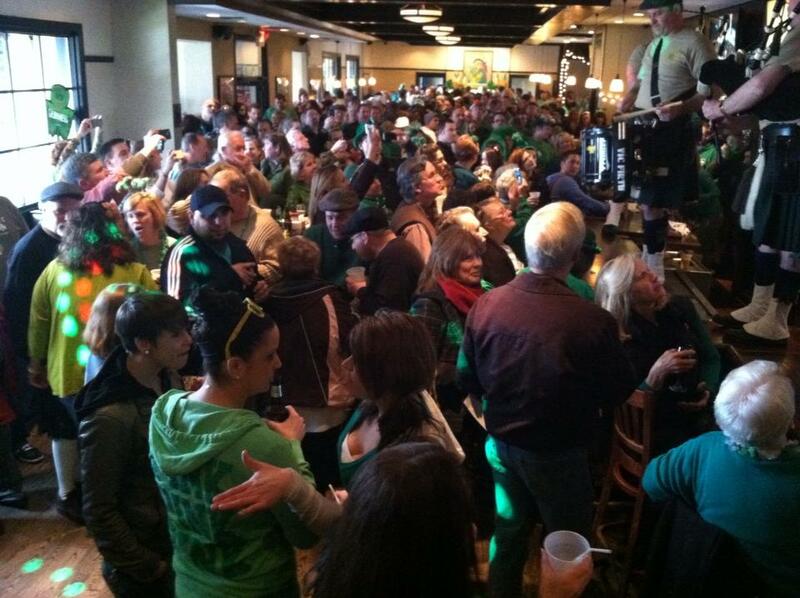 St. Paddy's Day weekend here in the old US of A. 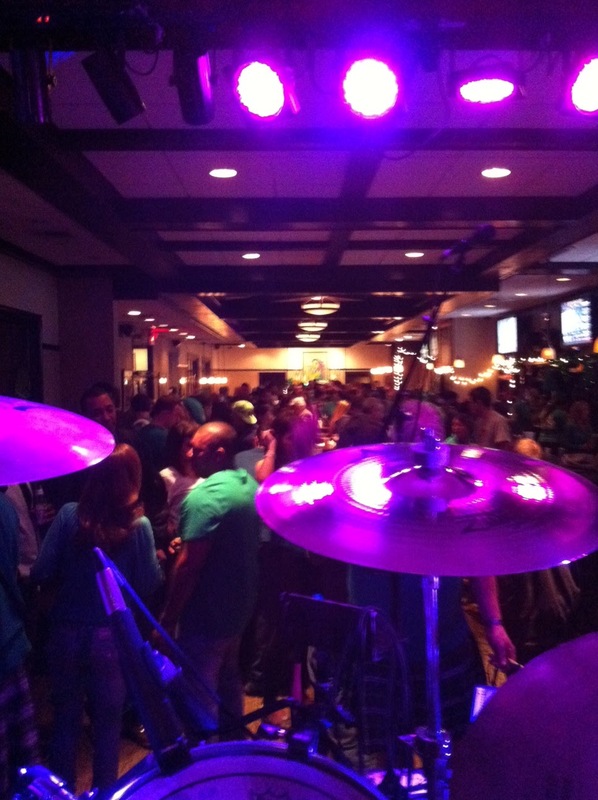 Our band, King Richard, played Saturday to an enthusiastic (and unusually attractive, for some reason) audience of green-clad dancin' fools. With a quicker-than-usual turn-around, we had to set up at ten o'clock the next morning for a job that began at 5 PM that day -- on the actual St. Paddy's Day. From the moment we took the stage, I knew the banshees, redcaps and sidhees has crawled forth, either out of the fairy earth or they had emerged from a woodland lake of Guinness and toadstools. 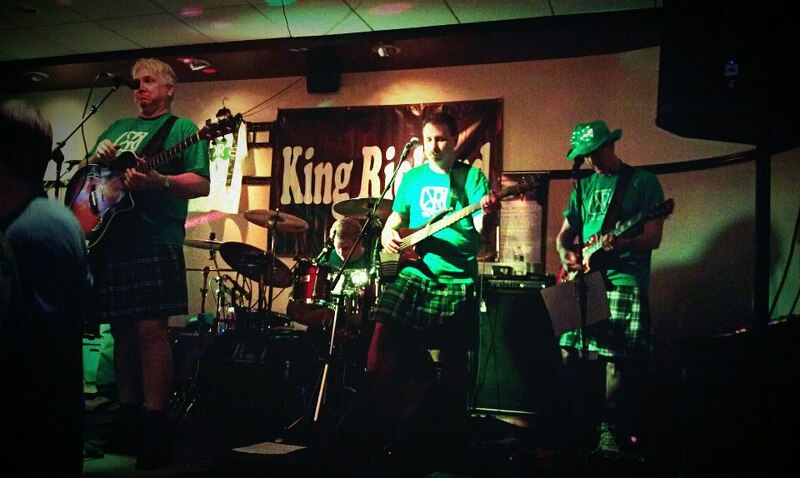 It was strange enough, sitting behind the drums, to have had to look at my band mates who all chose to wear kilts (which I always thought were more Scottish than Irish, though the traditional Irish bands in our area must know something -- they wear them). 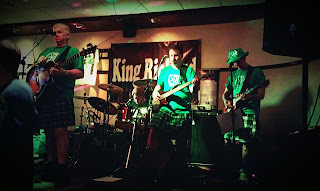 At any rate, I will say, at the risk of affecting my fellow musicians' self-esteem, that it is not the most pleasant thing to watch men in kilts bend over to adjust guitar effects and to pick up set lists. I'll leave it at that. 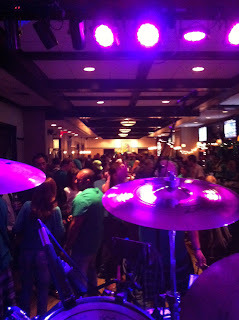 A drummer's eye view, sans kilts. Eventually, when the trad band had finished with its "Danny Boys" and its "Amazing Graces" (written by an English clergyman, if I am not mistaken...so....the connection to St. Paddy's is...?). They also played "Shenandoah," which I think is a beautiful tune, when it is not played on bagpipes (which it was). Still, as I was sitting on stage, I clapped, because, you know, everyone can see you up there. Then, after a gaggle of adorable little girls came out to dance some Irish steps (in a 5X5 foot spot) among a crowd that devoured them and to most of whom the poor lasses were invisible, it was our turn to play. We were the "main show" for the night. Because...let's face it...at some point, on St. Paddy's day, people are a little sick of the Irish stuff and they just want to rock out. We always oblige in that capacity. Early on, there were families there -- little kids dancing like willow trees in hurricanes as we played. It was entertaining, to say the least, though the dad in me couldn't help thinking that I would never have my kids that close to the powerful front speakers we use. We can be insufferably loud, really. As the night went on, between sets, I was accosted ("accosted" is not that much of an exaggeration) by a middle-aged chap in a flat cap who, despite having seen us play a set full of music by everyone from Elvis Costello to Bon Jovi to Bruno Mars, asked if we knew "The Boys of the Old Brigade." I told him I was familiar with it -- that it is a tune about the 1916 Easter Rising -- but that we, as a band, did not play it. Rather than having been impressed that some sweaty rock drummer knew the history of an important Irish song, he began to chastise me because the band did not know how to play it. Did I know how important that song is in Irish history? I wanted to tell him that Phillip Glass's Einstein on the Beach is important, too, but that doesn't mean a rock band has an obligation to tackle it . "Sir," I said. "We're a rock band...we were hired to play our usual music." His only response was "Pfft..." as he walked away. I think he called me a name, but it was hard to hear through the beer-grown Jersey-Irish brogue. As the night continued, we broke a bar record: most girls dancing on the bar at one time. I think we hit twenty. The bartenders confirmed this record. The bar confirmed its oaken constitution by not collapsing. For some strange reason, instead of being charmed by the energy in the room and by the response to our playing, all I can think when the girls do that is: a) it would be horrible if one of them were to fall, drunk as they are and b) tomorrow, some poor sap is going to sit down to a nice lunch of pub grub at that very bar-top and not know that, the night before, it had gotten danced on by shoes that had made three trips into the bathroom and that had scraped the sedimentary goo and grime off of a dance floor for four hours. Used to be the sight of pretty women dancing on bars conjured different sentiments. I dunno. The crown only thinned out a little, but the younger ones were left, packed up toward the front, glassy-eyed and dancing in ways that would have been illegal a few decades ago. Everyone who left had to work on Monday, or they were too old to party more and then go to work, anyway. The closing set was energetic. But it struck me that twenty-somethings are both demanding and as honest as cold steel. We'd play one song and they would be blowing us kisses and saying were were the best band ever. But make one misstep with song-selection, and it's back to pinched noses and thumbs down and people spitefully leaving the dance floor to sulk by the bar and drink from straws. I think she was yelling at the empty stage when we left. As far as I know, she still is. Well, I went home, plopped into bed and got up to go to school on Monday morning. The drums are still in my car. Maybe I will get them out of there before I have to load them up for the next gig. Maybe not. I'm a rebel like that.